courtesy of the Newburgh Suffragettes! Almost fifty years after they first met to demand the right to vote, the suffragette flag still only had four stars on it: two fully embroidered ones, representing Colorado and Wyoming where women were allowed to vote; two simply outlined, representing Utah and Idaho where women could vote in some elections. Women still did not have many work options, and when they did, it didn’t pay enough to live independently. They had no legal rights to their homes, so becoming orphaned and widowed could render them homeless. And divorce could have disastrous consequences, as their ex-husbands would determine the fate of the children, and there was no child support. The suffragette flag was hung across from the United States flag (then with just 44 stars itself) outside the recently-built Palantine Hotel in Newburgh from November 8-12 in 1895. On Saturday, November 11th, Newburgh will again play host to revolutionary women in leadership. Remembering the impossibly long and arduous path of the women’s rights movement, the Newburgh Suffragette Bike Parade and Community Convening will be a celebration in two parts. 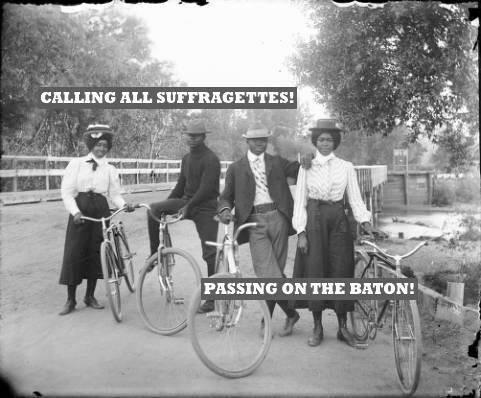 The Bike Parade at 1p is a playful recognition of how the bicycle became a tool and a symbol for women’s emancipation, and in Susan B. Anthony’s opinion, did more for women’s rights than any other thing. “I rejoice every time I see a woman ride by on a bike,” she wrote in 1896. “It gives her a feeling of self-reliance and independence the moment she takes her seat; and away she goes, the picture of untrammelled womanhood." Wear all white and ride down Broadway from Newburgh’s Court House at 300 Broadway to Newburgh’s City Hall at 83 Broadway. The Community Convening at 2p at the Newburgh Free Library at 124 Grand Street will include an expert panel discussion on the suffragette movement, the role of black suffragettes, and what it means for civic engagement today. Circles will be created so participants may share ideas and thoughts on solidarity, trust, and action in small group sessions. Please RSVP to NBSuffragettes@gmail.com, so they can plan snacks.